In retrospect it seems a little stupid. Jostling to be in the front of the pack with the fastest riders wasn’t necessary. I could have, maybe I should have, slowed down and simply enjoyed the view. But it isn’t everyday you get to fly down the 14,100 foot summit of Pikes Peak on a mountain bike. I was going to make the most of it. We knew the moment we saw the advertisement from Colorado Springs tour company Challenge Unlimited that this was something we absolutely had to try. We’ve driven and hiked to mountain vistas, but never before had we experienced the exhilaration and acceleration of descending on two wheels. And to do it on the very mountain that inspired Katharine Lee Bates to write America the Beautiful just felt, well, patriotic. We arrived early for the scheduled 8:00 A.M. departure time, giving us ample opportunity to sign the requisite release forms and fuel up on complementary bagels, muffins and coffee. It was going to be a long, exhausting, day at high altitude; the kind of day where second breakfast comes in handy. From our experience in the Rockies we knew the pleasant sixty degree morning temperature was a deception. We expected it to be as much as forty degrees colder, and far windier, at the top of Pikes Peak. At the summit we were indeed grateful for every stitch of the winter paraphernalia we brought. Had we forgotten anything, though, Challenge Unlimited had an assortment of warm weather clothing available to borrow. It was clear to us that they’d done this a time or two before. 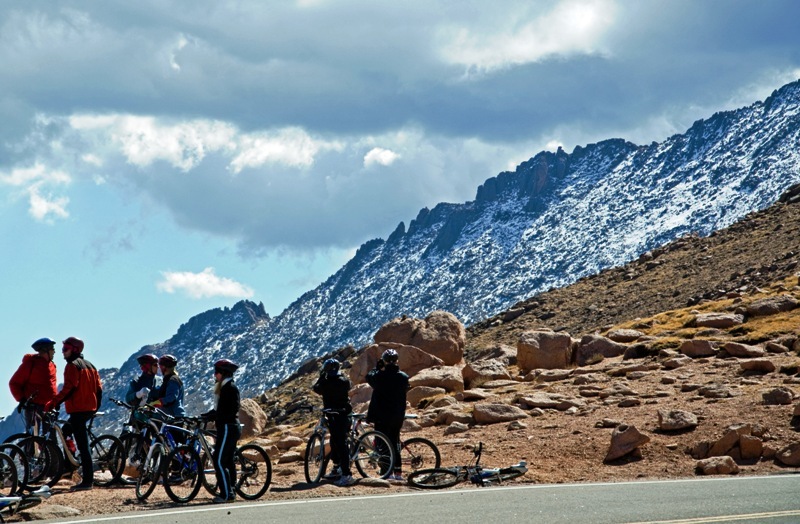 Outfitted with bikes, helmets, and the freshly-made “high altitude” doughnuts we procured at Pikes Peak café, we were ready to roll (is that third breakfast or Elevensies, I always get that confused?). I found the initial descent to be a bit of a sorting out process with people familiarizing themselves with the new bikes and testing their comfort level on the steep mountain grades. The pace wasn’t exactly slow, but our brakes got a hefty workout in the early going. It’s a good thing too, because above the tree line the views are absolutely spectacular. I was torn between wanting to race down the mountain and wanting to slowly take in the scenery. 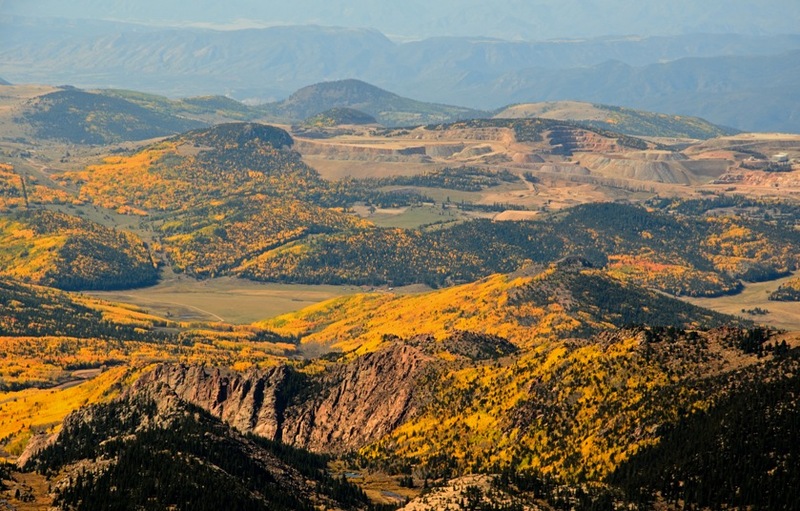 We were fortunate to arrive during peak foliage season when aspens paint the landscape in brilliant gold. By the fifth mile of our 19 mile trek tree growth began to obstruct the views. The good news is that allowed us to focus our attention more intently on biking. Our pace quickened accordingly. At times our descent was slowed by pokey car traffic we couldn’t pass. Other times, when unobstructed, we reached speeds near 45 miles per hour; so fast I could feel my helmet trying to lift off my head. What a rush! The trip wasn’t all downhill, although it was mostly so. A couple of climbs required some work, including a spot our guides affectionately named “that damned hill.” We were given the option of pedaling, walking or hopping in a van and riding up that damned hill. Most everyone chose to pedal, although a fair number threw in the towel at the mid-way mark and walked their bikes the rest of the way. I’m proud to say I toughed it out and conquered that damn hill! I do have a new appreciation, though, for the superhuman capabilities of Tour de France bicyclists. By one-o’clock we reached the end of the road, which fortunately concluded at Wines of Colorado, where we gathered one last time to recount our adventure over what might have been the best burgers I ever tasted. But then again, after spending several hours alternating between adrenalin and exertion, we had flat out missed Luncheon and I was long overdue for another meal. You can bike down Haleakala on Maui also! Love Haleakala – a completely different experience than Pikes Peak. We didn’t bike it, but maybe next time. Love the photos. Your blog helped me relive my travels in view of Pikes Peak. I do so love the mountains. Thanks for sharing. One Word – OMG! My other half did a similiar bike ride in Maui. Way cool!!! It was a fun ride in a car but your description of a bike ride down Pikes Peak blows that away!!! I would love to do that!!! Merry Christmas!!! The bike trip is very worthwhile. You can also take a cog rail up one side of the mountain and bike down the other. 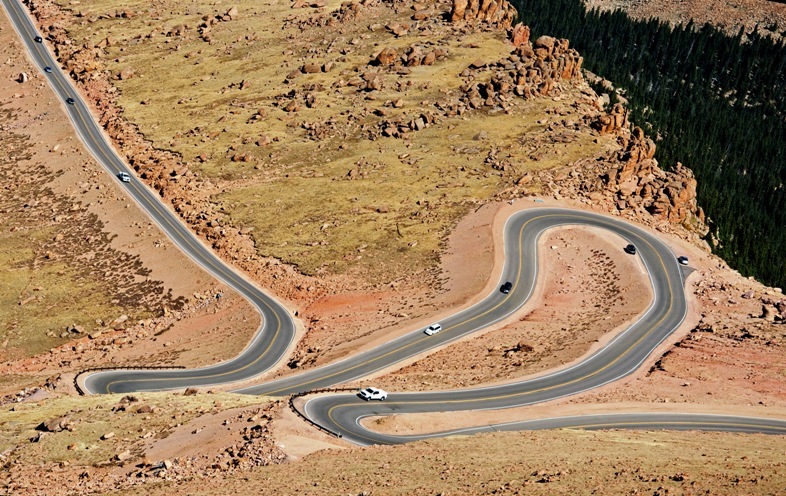 We didn’t do that because of the added expense, but it might be an even better way to see Pikes Peak. The pictures are breathtaking, great shots. I love Colorado Springs. Thanks for sharing. Colorado Springs is definitely a place we would consider using as a base when we’re not vagabonding around. That’s a short list, so far. Awesome! My boyfriend and I love to mountain bike and this looks like the ultimate experience, with amazing views to boot. Thanks for sharing. Hi Brian! Thank you for visiting and liking my recent post about Taiwan. I really appreciate it. You have a great travel blog. The pictures and stories are so amazing. Continue the travel and blogging. What I love about Colorado is that you can bike all year round and just an hour away are mountains for skiing. 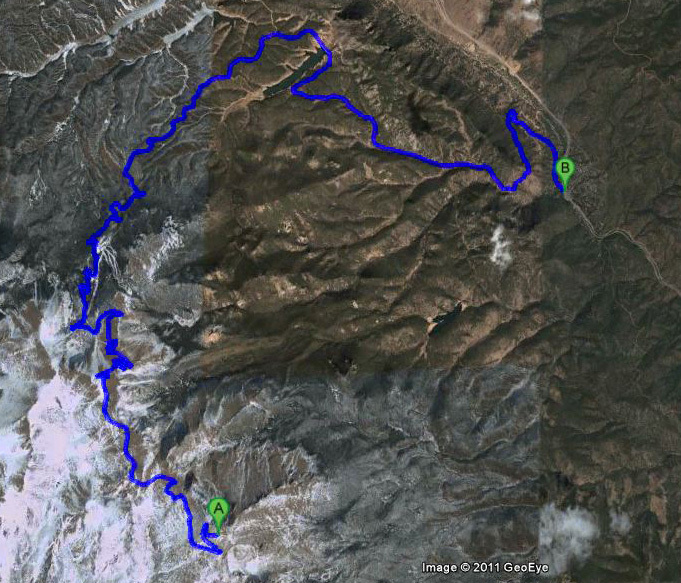 A friend of mine moved to Colorado Springs this last year – this ride is now on my list of “must-dos” for 2012! I’m a Colorado native. What beautiful photos you have captured! I love what you guys are doing, so inspiring! From the comfort of my computer chair, your descriptions made me feel like I was huffing and puffing to get up “that damned hill.” Thanks for sharing.